Have you been living with a slow-flushing toilet? If you have, then you know the frustrating of this seemingly minor problem. The truth is that when a toilet flushes slowly – or does not flush completely – you can see your water bill rise as well as your annoyance level. It is not uncommon for homeowners to ignore this problem but they shouldn’t. At 1st Choice Plumbing Heating & Air we offer expert plumbing services that can help with any number of issues, including slow flushing toilets. Keep reading to find out three of the common causes for this problem. Then reach out to us at 866-437-0205 if you need help. If you have a leak in a pipe then one of the symptoms is low water pressure. It is more common for homeowners to notice this issue due to leaks in showers or in their faucets, but it can be noticed in the toilet as well. If this is the problem then you need to contact an experienced plumber right away as there could be hidden leak that is allowing contaminated water into your home. If your toilet has suddenly started flushing much more slowly then this may be the cause. 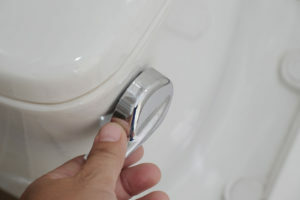 Wear and tear, damage, and just age can all lead to a toilet not flushing as quickly as it should. If your toilet has seemed to slowly get slower and slower to flush, then this is a possible reason. You may not notice any visible damage, but if it is past its prime then the internal mechanisms may not be working as well as they should. It could be as simple as replacing these mechanisms, or the best answer could be a new toilet. You can count on 1st Choice Plumbing Heating & Air to offer an honest assessment and advice. It is hard not to notice when you have a fully clogged toilet but it is possible that there is a partial clog under the surface that you simply don’t know about. The bad news about partial clogs is that they will eventually turn into full clots if they are not addressed. The good news is that at 1st Choice Plumbing Heating & Air we can provide complete draining cleaning services. When we are done, your pipes will be like-new and any clogs will be a think of the past. The bottom line is that the issues you are having with your toilet may become serious emergencies in the future if not handled. If you have noticed that your toilet is flushing slowly, or is simply not flushing the same way it used to, then we highly recommend contacting a California plumber sooner rather than later.